This interview was co-produced by artdesigncafe and Sculpture magazine’s web special (for ISC members). Michael Landy’s Art Bin, exhibition rights and moral rights, illustrated by M. Contraband, Esq. Click the photo to see the comic. Sometimes “punk” centers only on music, and other times it applies to art production and even professional practice. A native New Yorker, Hope London received a not so in-your-face BA in fine art, then an MFA in painting and drawing studying under Philip Pearlstein. Unexpectedly, this led to a degree in law from NYU, and a stint in animation, legal work, and punk music and culture influence in Los Angeles, which soon transformed into life, art, university teaching, and arts administration in Manchester, UK, including being Consultant Director of the city’s Castlefield Gallery, securing and managing a million pound budget, including a Lottery Grant, for space relocation. Now based up the coast in Scotland and in her early 60s, her M. Contraband, Esq. 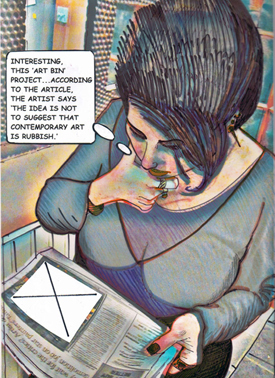 persona has emerged, combining comic art with legal discussion in a conversational style for those in the arts. The following are excerpts of a conversation between Hope London and her co-conspirator R.J. Preece, a Contributing Editor of Sculpture. R.J. Preece: In your vast experience involved in higher education and practice, what are the top 3 legal knowledge gaps that you see artists get caught out on? Hope London: Copyrights, trademarks, and patents. And within this: how to spot potential legal issues— both problems and opportunities. Say a contract where someone insists you transfer your copyright— that can cause future problems. But it’s an opportunity to license the work; just give the licensee what they need—like the right to use the work for specified times and uses. Of course, for this, developing and strengthening negotiation skills is essential. Creative entrepreneurship topic— copyright law. Comic detail by M. Contraband, Esq. Click the photo to see the comic. Preece: Do you think more fine arts programs should take real art business issues more seriously, especially as graduates face this the day after graduation? London: Yep! And not the day before graduation. An English university used to contact me to teach soon-to-be arts graduates about copyrights, contracts and marketing in two hours. It’s sad to spend three years studying your discipline and just two hours thinking about how you’re going to make a living. Preece: Do you think the cost of bookkeeping should be dealt with by the artist, or that they have the skills to manage the costs and risks? Or do you think it is okay that they focus exclusively on production and outsource this key business responsibility blindly? London: Bookkeeping paints a “numbers picture” of how you’re doing. It’s good discipline at the start. It keeps you from scrunching your receipts in a shoebox and shows how much it’s costing you to do your work— and how much you’ll have to earn to continue to do it. It gets you thinking about marketing issues— what you’re offering, who’s your audience. Most artists hate the M-word; others embrace it through their practice. Either way, it has to be acknowledged. Anyway, further down the line if you can afford a bookkeeper, why not? One proviso— remember they work for you; never abdicate your responsibility. There are well-known musicians who’ve been ripped off by their own finance people. Remember, you’re the boss. Andy Warhol said “Making money is art and working is art and good business is the best art”; there’s a lot of truth in that. Preece: At this juncture, do you think the era of education’s separation of production, marketing / sales and administration with an arguably massive over-emphasis on production, is drawing to a close? London: There was nothing in the curriculum about business when I was an art student in the 1970s. So I decided to study law to understand the mysterious world of contracts, intellectual property and other issues affecting artists. Creative business and copyright law. M. Contraband, Esq. 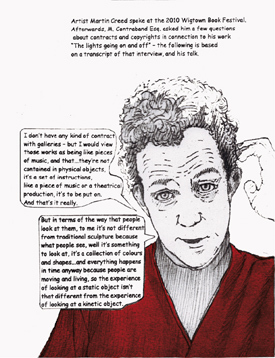 in conversation with Turner Prize-winning artist Martin Creed. Click the photo to see the comic. Preece: That’s why I also studied media / communications. No one in art programs really talks about how it works. London: I know. Today, there’s no excuse for teaching production alone, without teaching the business context and how to survive and thrive in that world. The internet offers vast possibilities for disseminating work. It’s forced to the foreground legal issues artists may have preferred to ignore. Preece: I recall you stating that when you got your BA in fine art and you asked a senior professor, "Okay, I want to continue with my art. Any advice?" She replied, "For men, be a taxi driver. For women, be a waitress.” How did you get past this to continue your arts career for 4-5 decades? London: I rejected the waitress approach because of my burgeoning feminist principles— remember, this was the 70s. She probably meant an artist’s day job should be a “McJob,” nothing you care about much or too demanding; if you get fired you can get another McJob. Presumably this leaves you with enough creative juice for your practice. I took another road. I can draw, so I got work in film animation. I also did a lot of legal work for animators, comic book artists, writers and publishers in LA. Animation was like waitressing, because you could have a laugh and do the work with half your brain. When I moved to Manchester and had children, it was challenging to get anything done. I managed a one-person show, Prepare to be a Mum at the Pankhurst Centre. I taught arts management, managed venues and festival projects, and always kept a personal project percolating. In 2005 I had an Arts Council England Grant for the Arts for a photo-documentary project with market traders at a 500-year-old market in Lancashire. Brilliant! And I always teach drawing— it sustains me creatively no matter what’s going on. I’m teaching an animation class now, working on M Contraband Esq. and painting. Preece: The UK especially seems to be making massive, quick strides to taking on practical professional practice issues very, very seriously with a full-range of developing initiatives. As we’ve discussed, it’s a funny feeling for us as I’ve been totally on this since the 90s and you in the 80s. Which initiatives are you particularly excited about? London: Programs like University of Warwick’s MA in Creative and Media Enterprises, an international mix of students with a shared passion to build creative businesses. Organizations like Own-It (London), AN magazine and artdesigncafe.com make law and business user-friendly and relevant to artists. Also knowledge-sharing initiatives between universities and industry, recognizing the value of intellectual property to economic growth. Preece: Thanks for the ADC plug! 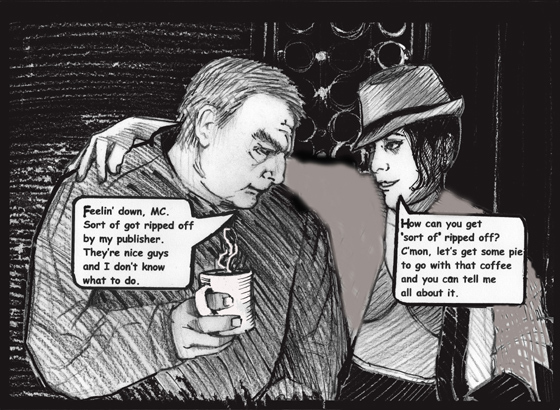 Going back to legal and your creative comic artist M. Contrabrand, Esq. project. The goal seems to be to present general legal issues and dilemmas in a straightforward way wrapped in comic art. Would you agree that anything that gets artists thinking about the practicalities of their legal rights and responsibilities is a good thing, given that any legal problem, often not reviewed in their higher education, can run into the thousands of dollars? M. Contraband, Esq. : In a word, yes! And the possible cost of litigation isn’t the main problem— it’s best to avoid litigation by understanding IP and negotiating clear contracts that spell out everyone’s rights and responsibilities. It might cost a bit but it’s usually worthwhile. Most written contracts don’t need to be terribly long. They should certainly be comprehensible— if there’s anything you don’t understand, ask. It’s your right to know. For those interested in ordering a copy of M. Contraband, Esq., Punk Lawyer, vol. 1 (2011), (GBP£10 / USD$17 incl. postage) contact MC at ojaydart [at] aol [dot] com. R.J. Preece is a Contributing Editor of Sculpture and publisher of artdesigncafe.com, which has an extensive online archive of professional practice writings in its Creative Business & Entrepreneurship section, including works / writings featuring M. Contraband, Esq.